The Australian Open is fast approaching and whilst we’ve been relaxing and eating mince pies, the tennis professionals have been hard at work. The period at the end of the year is known as the off season or pre-season on the tennis pro’s calendar. This time allows the players some rest from the tennis court to recharge both physically and mentally, before getting back into training in order to be in the best shape possible for the long competition season ahead. During the off season it is common for players to ‘cross-train’ and train in other sports to maintain and improve their fitness. Popular sports for cross-training include swimming, cycling, running and boxing, as well as continuing their strength work in the gym. Cross-training will continue to improve important aspects of the players’ fitness such as muscular endurance, strength, agility and speed but without the repetitive movements of being on a tennis court. The off season also allows players to work on weaknesses or small details that can make a huge difference to their game. This pre-season, the women’s world number 22, Victoria Azarenka has been focusing on correcting her footwork and agility after a long standing foot injury. These small changes may make a big difference to her speed and change of direction around the court in the approaching season. So, as a recreational or club player how can this benefit your game? This article recognises that tennis professionals use other sports as a means of maintaining and improving their fitness which will carry over onto the tennis court. Tennis is very repetitive and adding other training such as some specific strength work in the gym can make a big difference to performance on court as well as reducing the risk of injury. To find out more about the benefits of cross training and how this can help you on the court, please contact Kate one of our Physiotherapists. Alternatively for any help or advice or to book an appointment please contact us at one of our clinics. With the winter months ahead and the ski season beginning, it's time to think about some pre-skiing training so you can get the best out of your trip and Pilates is a great place to start. With exercises that focus on the core, hip stability, and overall flexibility. Pilates has it all when it comes to training. Skiing is a highly demanding sport that requires good strength to help maintain the dynamic and balanced posture essential for safe and efficient skiing. It means that you’ll be able to do a long day on the slopes without the fatigue kicking in, have the strength in the legs and confidence to do a mogul run, and wake up the next day not too sore to head out again. Some of my favourite exercises include: bridges, side lying leg work, lunges, and roll ups. These will help hugely with preventing lower back pain and overloaded knees. "I have a chronic knee condition but have always loved to go skiing. It was as a last resort that I tried Pilates. Georgie assessed my condition and helped me understand where the weaknesses were. She worked with me on very specific muscles around the knee joint and in particular she identified a real weakness in my gluteus. I learnt through Pilates how to activate and engage the glutes and so now instead them being idol and me ignoring them I can work the glutes and strengthen them. Following some 1-1 sessions with Georgie and then doing ongoing Pilates and other appropriate exercise I skied for a week in February, pain free for up to 6 hours a day. Looking forward to skiing again in 2016. I would strongly recommend Pilates as a way to rehabilitate, strengthen to prolong and enjoy pain free exercise. Georgie was positive, knowledgeable, very personable and appropriately tough!" To find out more about how Pilates can help you get the most out of your Skiing please contact Georgie our Pilates Teacher. So you’ve signed up for a marathon; sourced a program, bought new trainers, are thinking of training soon but have you thought of your conditioning? Pilates may not be the obvious choice for runners when planning their cross training but here’s why it should be: Running is a highly repetitive movement and if there are imbalances in the body it often leads to injuries as the mileage starts to increase. For efficiency and speed, runners need to eliminate any unnecessary sideways or up and down movements. Their bodies need to be able to smoothly rotate with each stride which requires balance and mobility as well as trunk and pelvic stability. All too often many runners suffer tight hamstrings, quads and IT bands and can pick up knee, hip and lower back injuries. These muscle imbalances then create strains and tension throughout the body. Which if not looked after properly can result in having to take time off from running to strengthen the areas of weakness. "Pilates develops the body uniformly, corrects wrong postures, restores physical vitality, invigorates the mind and elevates the spirit." - Joseph H. Pilates. Pilates works on pelvic stability to help any unwanted collapse of the hip and improve short foot contact times on the ground. The breathing helps to teach more effective breath patterns essential for maintaining good a running pace. It is also a great source of strength training particularly on the reformer where you can do squats and lunges with resistance. In April 2014 Georgie completed the Brighton marathon in 3:58. Previously she would have been in the gym lifting heavy weights as part of her program, but she decided to ditch the gym and instead spend time on the Reformer and use Pilates for her cross training. Overall how has Pilates helped and been included in your training? Pilates has been fantastic throughout my training, I have used sessions both for strength and flexibility. After the long Sunday runs it was great to jump on the studio equipment and get my body stretched out in ways I couldn’t do myself. I’ve also used the apparatus as a strength and conditioning session, creating a mini circuit with squats, lunges, upper body, and core. Do you think Pilates has helped you limit your injury risk? Massively so! What Pilates brings to you more than anything else is body awareness. Through my Pilates practice I soon noticed where my weaknesses were and then worked hard to correct them. It meant that when a niggle came up in my knee, foot, back etc, I could focus on strengthening that area and maintain good movement to keep me on track and avoid injury. Has Pilates helped with recovery after your training sessions? Yes hugely so. It has been invaluable knowing how to properly stretch out the body. I had kept quite a strict routine of coming home, having ice bath, and doing some gently stretches and mobility. "You can tell the power of Pilates and its brilliance as the next day I am walking normally and not hobbling about in pain!" To find out more about how Pilates and the Reformer can help your Marathon training and running programme please contact Georgie our Pilates Teacher. We are delighted to announce that following the success of our January Pilates classes from February 23rd 2015 we will be offering a second course of Pilates and Circuit classes at our new Clinic at Pavilion and Avenue Tennis Club, The Droveway, Hove. Our newest team member Georgie Shand will be be instructing on our Pilates courses.Georgie graduated from St Mary’s University with a degree in Sports Rehabilitation in 2008. In 2009 she trained with the Pilates Foundation as a matwork teacher, and more recently in the Apparatus.Georgie has worked with various sports teams and clubs drawing on her own passion for sport as a way of providing thorough rehabilitation and training program’s. Over the years the Pilates training has complemented the injury rehabilitation and added to her skills as a therapist. She has completed level one strength and conditioning and more recently has embarked on Joanna Elphinston performane training. This has given Georgie a deeper understanding of movement and functional training. She has had great success in getting individuals back to their sport or particular goal through a combination of home exercises programs, manual therapy, and Pilates. Classes will run once a week for a 6 week period costing £60 paid in advance. A range of classes will be available to suit all needs. Beginners: This class is for people with little or no Pilates experience. You will learn the principles of Pilates; control, concentration, centering, precision, breathing, and flow, and how this will benefit your body. The focus of classes will be on creating balance in the body, strengthening the core postural muscles and working on stability and co-ordination. Improvers: This class is suitable for those who already have some experience of Pilates and have mastered the Pilates principles; they understand the breath, alignment, and basic movements. They must have good core stability as the classes will be more dynamic and work deeper into improving your strength and flexibility. Tennis Specific Circuit Pilates: This is a circuits based Pilates class with a specific tennis focus; to help those to become more integrated with their bodies from the feet through the legs, pelvis, trunk, and arms. The exercises will be more functional bringing in squats, lunges, etc to keep up with the demands of the sport. One to one sessions: For those with a specific injury requiring rehabilitation or for others wanting to have private personal pilates we provide one to one sessions. These allow programs to be designed specifically for you and to help motivate you with your training. We will use small pieces of equipment and often set home exercises to gain the strength and/or rehabilitation from injury that you require. Sports Massage - the benefits are for all of us not just athletes! What is Sports Massage? Sports massage is a deep tissue massage that includes a variety of techniques including the stretching, compression, frictioning and trigger pointing of the muscles. It has a number of physical, physiological and psychological effects. Sports massage can help to prevent injuries and loss of mobility, restoring balance to the musculoskeletal system of the body. Give the gift of health this Christmas. Gift vouchers are available to purchase for all of our great services. We can email or post gift vouchers if you would like to order over the phone or online. For information on any of our services please get in touch. Here at The Physio Rooms Brighton we are in the privileged position to have one of the UK's leading specialists in running and Gait analysis, expert physiotherapist Tom Goom. Tom has been part of The Physio Rooms family for over four years. In that time he has created one of the top running information web sites www.running-physio.com. He is also a multi published author with features in Running Fitness, Mens Running UK and Marathon Running. He is currently putting the finishing touches to a research paper on proximal hamstring tendinopathy which he is hoping to have published later this year. The Physio Rooms Brighton is very fortunate to have been represented at The Wimbledon Championship over recent years. Mike Boyce who is lead physiotherapist at The High Performance Tennis Centre (HPC) in Brighton has provided physiotherapy support for a number of players. Mike has worked closely with athletes with pre-event support including biomechanical screening, strength and conditioning, video analysis and injury treatments. Mike has travelled to the Wimbledon as part of the players team to provide support before, during and after matches. Mike has had the opportunity to work alongside the worlds top players with has proven to be an invaluable experience. So if your struggling with an tennis niggle or injury which is keeping you off court or if you would like some help with your tennis performance on court why not call us today for some expert advice. Low back pain (LBP) has a high incidence rate and will effect 20% of the adult population each year. Over 40% of people will at some stage in their lives suffer with LBP. Pain will commonly occur from the bottom of the rib cage down to the top of the buttock and gluteal region. Pain can also frequently radiate into the lower limbs. There can be several structures that can cause pain including: muscles, nerves, discs, joints, and other connective tissues. A key issue in the treatment of low back pain is identifying the cause of the individual’s pain and implementing an appropriate management strategy. Whether it is tissue over load due to inappropriately sustained postures or acute injury due to muscle imbalance or poor lifting technique a guided treatment plan should help reduce pain and begin the road to recovery. Here at The Physio Rooms one of our team of physiotherapists can help you with manual therapies to easy your pain and exercise prescription to help you achieve a full recovery with a ongoing management plan. Contact our Brighton Clinic to book an appointment. The majority of ankle sprains are caused by ‘rolling’ the ankle inwards as a result of quick movement over a short distance, with changes in direction on the tennis court. This results in the ligaments over the outside of the ankle (lateral) to overstretch or tear. Only 5-10% of ankle sprains occur to the ligaments on the inside of the ankle, as these ligaments are stronger and provide more stability than the lateral ones. Symptoms include pain over the ankle, swelling and bruising. Early rehabilitation for ankle sprains should include ankle movements, strengthening and proprioception exercises. More advanced exercises to improve the stability of the lateral ankle ligaments include single leg stand and lunges on a wobble board/cushion and lateral bounds. Shoulder pain in tennis players is often due to the repetitive strain placed on the joint during shots, particularly the serve. Injury to the shoulder may be due to muscle imbalance, weakness and tightness. Some common causes of shoulder pain include rotator cuff injuries, shoulder bursitis and impingement. The rotator cuff is a group of four muscles that surround the shoulder and provide it with strength and stability. These muscles are key in all of the tennis strokes, so it is important that athletes strengthen and stretch the muscles to prevent injury. The repetitive movements of tennis strokes can also cause a fluid-filled sac called a bursa to become irritated and inflamed, another cause of shoulder pain. Impingement is also a common cause of shoulder pain and is due to a pinching or aggravation of a tendon and/or bursa usually when lifting or rotating the arm, particularly during serving and high forehands. Shoulder pain can be prevented by strengthening and stretching all the rotator cuff muscles. Exercises include external rotation, internal rotation, shoulder abduction and hand behind back with resistance band. These exercises can be easily performed with a resistance band and it is common to see professional tennis players using these exercises during their warm up on court. Muscle strains in tennis are often injuries to the calfs, hamstrings and abdominals as a result of muscle tightness or weakness. Calf and hamstring strains usually occur after quick explosive movements around the court, whereas abdominal strains are frequently on the non-dominant side from stretching up during the serve. Muscle strains can be prevented by doing an adequate warm up and cool down, wearing appropriate clothing and gradually building up training. Some exercises to strengthen the hamstrings and calf muscle groups include squat jumps, scissor jumps, linear and lateral bounds. Isometric abdominal contractions and crunches will work to strengthen the abdominal muscles. If you have any of the conditions above or want to avoid injury in the future why not contact our Brighton Physiotherapy Clinic to see one our highly qualified physiotherapists for some treatment and advice. Tennis Elbow - surprisingly not just for Tennis pros! Tennis elbow, otherwise medically known as lateral epicondylalgia is a painful, chronic condition associated with symptoms on the lateral side of the elbow. While commonly associated with playing tennis less the 5% of sufferers do in fact play tennis. This injury is often work-related, any activity involving wrist extension, pronation or supination during manual labour, housework and hobbies are considered as important causal factors. Tennis elbow is a relatively common condition that can affect people who preform repetitive movements of the upper body such as painters, carpenters, musicians and computer and I.T. workers. Overuse of the muscles and tendons of the forearm and elbow together with repetitive gripping or manual tasks can put excess strain on the elbow tendons. Tennis elbow sufferers will often report weakness in their grip strength or difficulty carrying objects in their hand, especially with the elbow extended. They commonly experience pain and localised tenderness over the lateral elbow. Tennis players Approximately 40% of people who play tennis on a regular basis have reported a current or previous incidence of elbow pain. Tennis elbow is more common in individuals over 40 with 40% of players describing their symptoms as severe or debilitating. As with any injury or pain it is very important to first get a professional diagnosis. Once a tennis elbow injury has been identified a comprehensive treatment plan can help reduce recovery time. Manual therapies, exercise prescription and advice regarding posture and technique can all be helpful. If you have elbow pain or would like any advice please feel free to contact us at our Brighton Clinic. Are you among the 66% of runners who regularly runs with niggles and pain? Are you new to running and eager to make sure that you are doing the right thing? Are you floundering trying to achieve that new personal best? Which ever one of these categories you fall into one sure fire way to help you archive your running goals in the most efficient and injury free way is to seek the advice of one of our running Physio experts. Gait analysis is a systematic procedure of analysing locomotion in humans. Gait analysis is used to assess, plan and treat individuals who have difficulty with walking or running. During your appointment we provide a detailed biomechanics assessment, we also carry out video gait analysis looking at various factors and parameters such as stride length, stride width, cadence etc.. Following this we can provide further assessment and design a specific program including strength and conditioning to help you achieve your goals. So whether you a trying to run with injury, trying to achieve a personal best or you are new to the world of running why not come to our Brighton clinic and meet one of our running injury physiotherapists who are all run coach qualified and experts in all areas of running. Our lifestyles have changed dramatically in the past thirty to forty years. As we see ourselves spending more and more time sitting down at computers and televisions, we are also seeing neck pain becoming increasingly common throughout the world. Neck pain has now joined back pain as the two most common pain locations in the body. Acute neck pain (pain that manifests abruptly) generally has little to do with this change in our society, but can be caused by sudden jerky movements of the head and neck, or by trauma injuries from sporting accidents and falls. Whiplash occurs when the head is suddenly moved backwards and forwards, causing the muscles and ligaments of the neck to strain and in some cases tear. Whiplash is commonly experienced in rear-end car collisions and can produce pain and aching to the neck and back, referred pain to the shoulders, and often headaches. Simple neck pain implies pain that arises due to relatively minor problems with the muscles, ligaments and joints of the neck. Simple neck pain can come on after a minor injury or sprain but in many cases no injury can be identified. It can arise after something as simple as sleeping badly in bed at night. This type of pain comes about because the sprained tissue becomes inflamed and causes pain signals to be sent to the spinal cord. However, most neck pain that is not caused by whiplash or trauma has a postural component as part of the underlying problem. Sitting in front of a computer with bad seating and posture frequently leads to muscular pain in the neck, back and shoulders. A common cause of postural neck pain is the Forward Head and Shoulder posture. This occurs when the neck slants forward, placing the head in front of the shoulders. (This can be observed while working at a computer, laptop, ipad, iphone, T.V., driving for example.) This position places undue stress on the vertebrae of the lower neck. The muscles of the upper back are also continually overworked to counter-balance the pull of gravity on the forward head. Forward shoulders and a rounded upper back with increased extension of the cervical spine often accompany this position is also commonly seen. This leads to very tight pectoral muscles and causes a lot of tension between the shoulders as well as contributing to the neck pain. Physiotherapy assessment to and treatments such as manual therapies, massage and stretching can help ease symptoms. Postural reeducation is key. A patient specific exercise program to help mobilize and strengthening the back, neck and shoulders in order to pull the shoulders back into a neutral position can alleviate some of this tension and pain. Stretching before and at intervals during the working day can also do wonders for tight, tired muscles. If you are suffering with neck, shoulder or upper back pain why not contact our Brighton physiotherapy clinic today. One of highly trained physiotherapist will be more than happy to guide you on the road to recovery. With the 20th Fifa world Cup kicking off in Brazil during June, intensity levels are increasing for football players who have been working hard throughout the year. Sporting injuries however, come with the territory of the game. Football has recently become the world’s most popular sport with over 240 million registered players and even more recreational players. There are a few injury types that make up the bulk of injuries in football. Not surprisingly, 50-80% of these injuries concern the legs and feet of the players. An injury to the hamstring muscles or tendons occurs when fibres tear due to the muscles being stretched beyond their limits. A tear in the muscles is referred to as a strain and can be classified depending on severity as a first, a second, or a third degree strain. A hamstring strain usually occurs during running or high velocity movements. To prevent a tear in hamstring muscles gluteal and eccentric hamstring strengthening exercises are recommended along with adequate warm up before activity. A warm up, prior to matches and training is thought to decrease muscle injuries because as body temperature increases, muscles become more extensible and can withstand longer lengths of stretching. A specific and adequate strength and condition program has been shown to reduced this type of injury by 50%. Ankle sprains in football usually follow a typical pattern. The sole of the foot rolls under, damaging the ligaments of the outer ankle. Ankle injuries account for 40-45% of leg injuries. To prevent ankle injuries proprioceptive and balance exercises (both double and single leg) are advised. Local muscle strengthening to the ankle joint also decreases the risk of ankle sprain. When recovering from injury taping and bracing the ankle can help to reduce the risk of ankle sprains. Taping provides support for the ankles and improves stability. The anterior Cruciate ligament (ACL) is the main ligament involved in stabilising the knee. It helps prevent the tibia sliding out in front of the femur. Partial tears of the ACL are rare; most ACL injuries are complete or near complete tears. The ACL can be injured in several different ways in football, most notably by landing from a jump onto a bent knee then twisting, or landing on a knee that is over extended. Direct contact on the knee from opponents can also cause damage to the ACL. Research found that player to player contact is the leading cause of injuries in football. Treatment for an ACL tear will vary depending on the patients individual needs. For example, a football player involved in agility sports will most likely require surgery to safely return to sports. Proprioceptive and balance exercises and quadriceps and hamstring strengthening exercises are thought to be very effective in prevention of ACL injuries, as well as during rehabilitation. In the knee, there are areas of cartilage tissue, which act like shock absorbers in the joint –theses are called menisci. There are two menisci within each knee joint that are made from tough fibrocartilage. The classical injury is for a footballer to twist the knee whilst the foot is still on the ground. For example, whilst dribbling round a defender. How serious the injury is depends on how much of the meniscus is torn and the exact site of the tear. Having strong quadriceps and hamstring muscles that can deal with the strain on the knee may be helpful in preventing knee cartilage tears. Small cartilage tears may settle with physiotherapy treatment, but more significant cartilage tears may require surgery. Hernia and groin problems are common in sports such as football where the pelvic region undergoes large stresses during kicking, sprinting and turning. The two most common conditions that affect footballers are an inguinal hernia and Gilmore’s groin. After matches and training players with hernias will experience stiffness and pain in the groin are. In the early stages of a hernia, activity can be continued but the problem usually gets progressively worse. To reduce the risk of developing a hernia core strength and core stability are essential. This improved muscular strength and stability can help to counteract the large forces that are applied to the lower abdomen and pelvis. If you are suffer with any of the above injuries why not contact our Brighton Clinic's team of highly trained physiotherapists for an appointment and get back on the road to recovery. On Thursday the 22 May we were invited along to Brighton and Hove Women's Running Club (BHWRC) to discuss injury prevention when starting out as a new runner. Tom also went for a run with the Club then helped out with stretches and advised any injured runners. After, he provided a brief talk on injury prevention and answered a handful of runner's questions. BHWRC is a friendly club with great support for new athletes, we highly recommend them for runners of all levels. 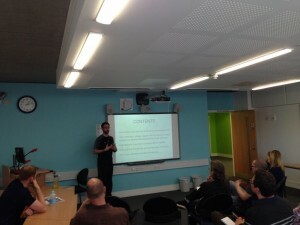 Tom has recently delivered a series of three work shops to the staff at Sussex Uni in association with Sussex Uni Sport titled 'Commit To Get Fit'. The objective of this series was to encouraging participation in exercise, avoiding injury and building strength and flexibility. It was a pleasure to team up with Terry Cooper and Mark Beresford and we look forward to working with them in the future.